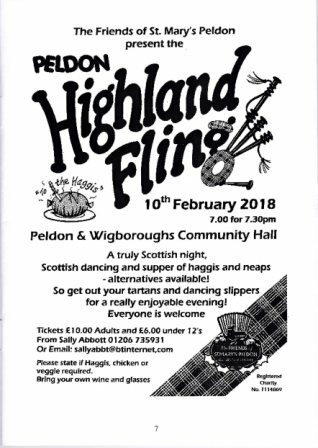 In Peldon & Wigboroughs Community Hall. 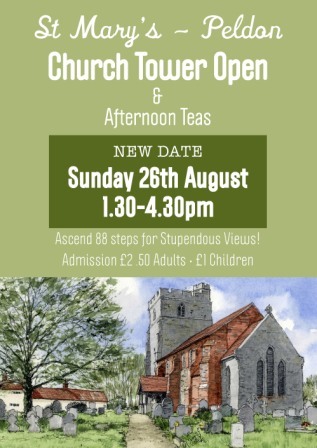 A bigger event than before, hosted jointly by the Friends and the Wigboroughs Community Group. Meet at the car park of the Peldon & Wigboroughs Community Hall for carol singing round the village, and a reception afterwards (venue to be advised). A concert of memorable songs from the music halls of Dixie, Newcastle and the East End. By Octavia and Towering Angels (from Quire) with instrumentalists. This should be a lot of fun! Admission £10 (£8 Concessions) at the door, or call Bill on 01206 735770 for reservations. Fantastic views from the top of the tower. Afternoon teas. Peldon History Lectures presents: 'We wish you a merry..?' Prof. Bill Tamblyn unravels the history of carols - from when originally sung from the medieval church steps to the modern practice of singing around the streets, and of course the 'carols' we hear in shops and on the media. Bring your voices! We need to try out a few songs! In aid of the fabric fund. There will be seasonal refreshments!